I actually tried to make a dish for my Apples to Oranges Dutch Oven Challenge about three weeks ago or so, but it didn’t turn out very well. It wasn’t BAD, but it wasn’t what I wanted, and it certainly wasn’t as cool as some of the other entries. I did a pan-fried ham steak with an attempt at an orange/apple glaze. In the end it was good, but not great. 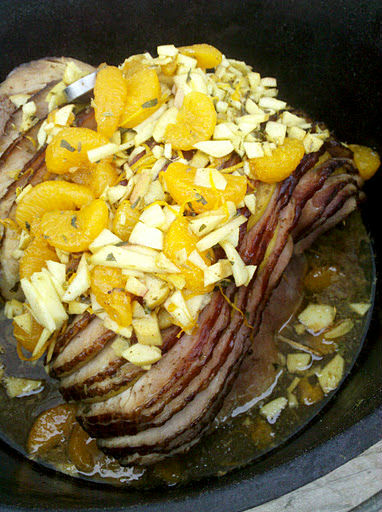 Well, for our big family Thanksgiving dinner this week (today, actually), I was asked to do a ham. An idea started forming, so I gave it a shot. It turned out to be really, really yummy. It did have several steps to the process, but it was overall pretty easy. The spices played pretty nicely together. I did stick with pretty much the sweet end of the spice spectrum, though. I didn't get to crossover-crazy with the savories. I started out by lighting up some coals. I got one of my big 14” deep dutch ovens out and oiled it inside and out. I put that on a lot of coals, with some on the lid as well, to preheat, and to set some of the seasoning on the patina. While the Dutch oven was heating up, I cut up the apples. I sliced them very thin. I didn’t have any whole cloves, so I just sprinkled some ground cloves onto the apple slices and stirred them up really well. The ham had been thawing in the fridge for almost a week. I cut open the bag and drained it, then put the ham on a plate on the counter, lying on its side. 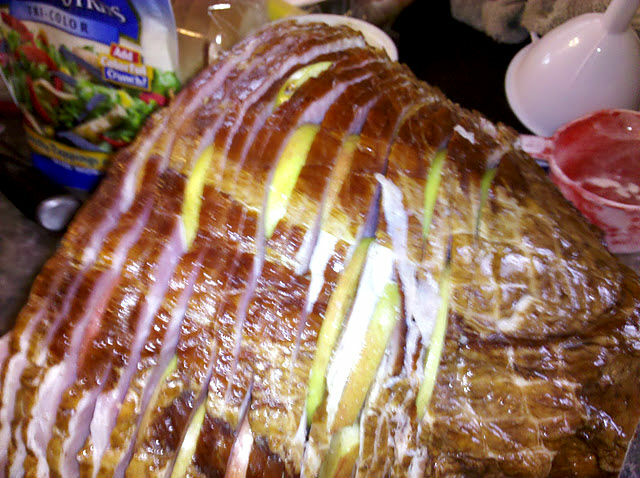 I inserted the apple slices into the spiral slices of the ham. If I had been using whole cloves, I would have inserted them as well. I kinda staggered them from layer to layer. That kept it from bulging out too much. I did that on both sides, then put it in the dutch oven to cook. I cooked it for about two hours. After about an hour, I made the glaze. I basically just mixed the ingredients. It wasn’t as thick as I wanted it to be, but it still worked. I did try something new. The nutmeg was whole, and freshly grated, and the fennel was ground in my mortar and pestle. The smell of the nutmeg as I was grating it was in-cred-ible. So, I just basted about ¾ of the sauce/glaze onto the top of the ham in the last 45 minutes or so of the roasting and let it settle in. About 15 minutes before taking it off the coals, I put the last of the sauce on. When it was all done, it tasted delicious. I could taste all of the flavors intermingling. I also made a loaf of spice bread, and added some dried cranberries. that was really delicious, too, and both dishes were a hit with the family. Mark: Thanks for the comment. I left a reply for you at that post. Toni used my Sig. dish (Tomato up-side-down Cornbread) in a competition, and won with if. 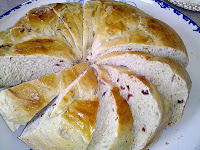 See comment at roguedutchovencookers.blogspot.com Christmas up-side-down cake. ark: Who else took your challenge.List there posts so we can look at them.